HCM City's waterways were once filled with refuse and surrounded by slums, but a recent transformation made them colourful landscapes where community residents are happy to gather. Pre-cleaning: The Tau Hu-Ben Nghe Canal before it was cleaned up. She sees it everyday, but 75-year-old Nguyen Thu Hang still cannot believe her eyes. "Even in my dream I cannot imagine this scene," Hang said as she watched her grandchild play besides flower beds on the pavement of Hoang Sa Street running along the Nhieu Loc-Thi Nghe Canal in HCM City. "When I was young, I spent the entire day on a small boat. Everyday, I rowed it, weaving my way through refuse floating densely on the surface of the Nhieu Loc-Thi Nghe Canal to pick up waste plastic bags so I could eke out a living. "But now, everything has changed and become so wonderful! The canal now is so clean and beautiful!" Though I am not a native, I know what Hang means. I have lived in HCM City for nearly 20 years and the transformation of its canals is the most impressive of all the changes I have seen here to date. When I first moved here, the canals were very dirty with stinking blackish water overwhelmed with floating refuse. 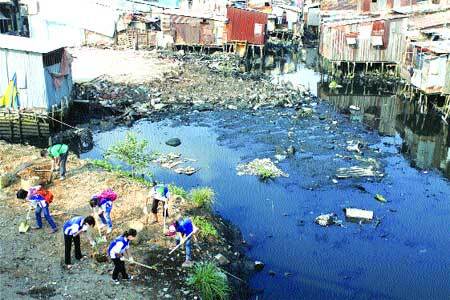 Mosquitoes and rats flourished in the largest slum area of the city. The scene was bleak and heart-sinking, and the canal, one of the major waterways in the city, was a prominent part of it for many decades. People who have stayed in the area for long remember this clearly. Standing in front of his house beside the canal today, 72-year-old Huynh Tan Suong in Phu Nhuan District's Ward 2 recalled: "Before the 1970s, due to the war, thousands of people from many surrounding provinces flocked to Sai Gon. The poor people used every inch of space alongside the canal to pitch their tents. "Squalid houses were built on stakes driven into the canal's bed, made with the cheapest materials like old wood or plastic planks, carton boards or corrugated iron sheets. The canal became really fetid because household rubbish was directly dumped into it. Day after day, the refuse gathered, blocking the water flow and narrowing the canal, which seemed to have died in the 1980s." Clean look: The Tau Hu-Ben Nghe Canal after it was cleaned. Suong is delighted with the resurrection he has seen. "It is quite different now. The landscape along the canal looks like a small park with colourful flowers and people going for walks to get fresh air," he said. He is right. Now, whenever I have the time, I choose to ride on the roads alongside the canal to go to my office or return home. I drive the motorbike slowly to watch a very different life unfold on its banks. Rows of willow trees lean over and are reflected on the water surface instead of the slums. Parterres with various kinds of flowers almost always in bloom add to the beauty. Here and there, groups of people, young and old, exercise on machines that have been installed for the purpose, or take brisk walks. Others drink and eat at small roadside eateries and coffee shops on the other side. Nguyen Minh Dung, former director of the municipal Construction Department, also grew up near the canal. "Virtually the entire canal, in all the districts - 1, 3, 10, Phu Nhuan, Tan Binh, Binh Thanh and Go Vap - was heavily polluted and seriously affected the city's social life. "Although its waters are now not as clear as in local rivers, they are flowing again, the stink is gone and its banks have been transformed into greenbelt," Dung said. 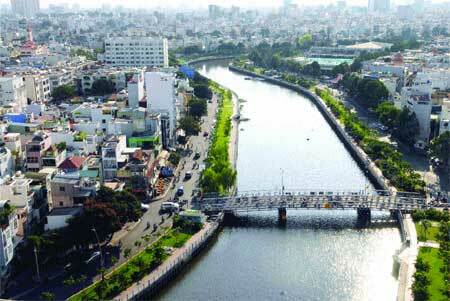 The Tau Hu-Ben Nghe Canal has also undergone a wonderful transformation. Image boost: HCM City brightened its image by restoring the Nhieu Loc-Thi Nghe Canal. Sitting in front of her house near the canal, Nguyen Thi Thom said she remembers clearly the days when the canal stank horribly and was bordered with makeshift houses. For nearly 50 years, her family has lived near Cau Kieu Bridge which crosses the canal in Phu Nhuan District. "For about 40 years, I have seen countless changes, but the life of people here only changed for real when the city began its big water environment improvement projects," Thom said. "In the past, I could see that no creatures could survive in the putrid waters of this canal, but now my family members and neighbours have a quiet life here." On a breezy day with light sunshine in early April, I was able to see government officials and local residents release 450,000 fry into the Tau Hu - Ben Nghe Canal. There were carps, tilapias, catfishes and anabas. I learnt that similar releases had happened last year at the Nhieu Loc-Thi Nghe and Tau Hu-Ben Nghe canals. Making a splash: HCM City authorities release 450,000 fish into Tau Hu-Ben Nghe Canal in District 1 to celebrate the 55th anniversary of the Vietnam Fisheries Industry. That the canal waters are good enough for fish to survive is remarkable and shows genuine revival, I thought. Tran Dinh Vinh, head of the Fishery Resource Protection and Quality Control Division, said the release of fish aimed to regenerate marine resources in these canals. "Before releasing the fish into the canals, concerned agencies had taken samples of water for testing, and the results showed that it was good enough for fish to survive and grow." They checked the waters' pH level, dissolved oxygen (DO), heavy metal and some other contents, he said. 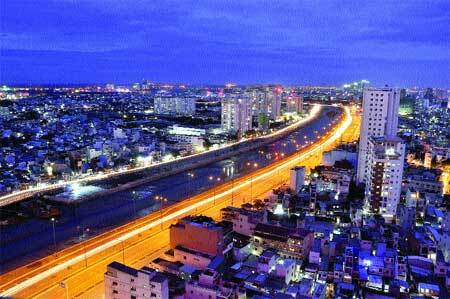 HCM City's extensive .runs a total of 1,500 kilometres, was once a source of pride for the Saigonese. The waterways not only linked the city with the Cuu Long (Mekong) Delta and surrounding provinces, but also played an important role in servicing the city's sewage and drainage infrastructure. Cleanup: More than 400 young volunteers from universities, companies and the armed forces clean up the U Cay Channel in District 8, which is also in the city's sights for a cleanup. But as the city's population grew, the rivers and canals experienced rapid degradation. They also shrank and no longer flowed freely. Worse, they became prone to overflowing during heavy rains and high tides. Efforts to remedy the situation began almost 39 years ago when Sai Gon was liberated. Repair and upgrade works were carried out to parts of the drainage system and a few of the major canals were dredged, but the scale of the problem was too big, and the remedial actions too small. Recognizing that more drastic measures were needed, around the turn of the century, city authorities, with assistance from foreign experts, initiated a major environmental sanitation initiative that would clean up the city's canals, including Nhieu Loc-Thi Nghe and Tau Hu-Ben Nghe that run through 10 inner-city districts. Because the 8.7km long Nhieu Loc-Thi Nghe Canal was considered the worst of the lot, it was chosen as the pilot for a VND8.6 trillion (US$407.58 million) project in 2003. The canal was heavily polluted by untreated wastewater from an aged sewer system inadequate to serve the rapidly growing population. The untreated wastewater in the canals posed a serious threat to public health. The project included a massive wastewater pumping station that could handle 64,000 cubic metres per day. It could also treat the water to improve its quality. 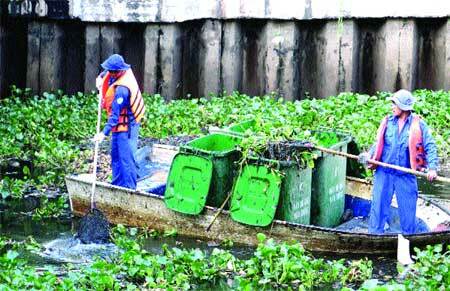 Some $116.6 million were spent cleaning up the canal, improving infrastructure around it and repairing drainage and water treatment systems to improve the health and daily life of around 1.2 million residents in the area. Several new residential areas were built to accommodate thousands of apartments and hundreds of housing foundations set up to help resettle families from project areas. The city also injected VND554 billion ($26.26 million) into upgrading the Hoang Sa and Truong Sa streets that run along the Nhieu Loc-Thi Nghe Canal, and the results are evident. These are two of the most beautiful streets in the city now. Phan Chau Thuan, deputy head of the managing board of Nhieu Loc-Thi Nghe, said although the project has not been completed yet, the canal has "almost become a green canal" because most of its wastewater is collected and treated at a treatment plant in District 2 which is still under construction. Meanwhile, thousands of households that live along the Tau Hu-Ben Nghe Canal have benefited a great deal from the city's water environment improvement project. Under this, equipment has been installed to collect wastewater from households living near the canal and transfer it to the Binh Hung wastewater treatment facility in Binh Chanh District. 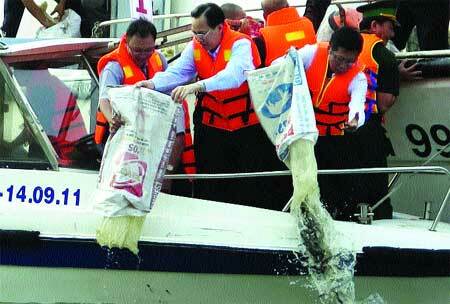 The canal's bed has also been dredged, said Luong Minh Phuc, head of the project's managing board. Wastewater has been collected from nearly three million households in districts 1, 2, 3, 4, 5, 8, 10, 11, Phu Nhuan, Tan Binh, Binh Thanh, Go Vap, and Binh Chanh, he added. Le Hoang Quan, chairman of the HCM City People's Committee, has said that the projects do seek to beautify the city, but more importantly, they target enhancing the daily life of the residents. As the urban environment improvement projects continue to be carried out, city residents can take heart from the changes they have already made to the city's image and their living conditions. For many, this is a reality show with a fairy-tale ending.